Read Before Use - User Tips1. Upgrade version with power on/off button.2. Find a vacant or non-interfered frequency and sync Nulaxy device to that frequency for minimized static noise.3. To achieve best audio quality, please set the volume on your phone to maximum and then adjust the volume for your car stereo; you are not suggested to adjust volume of your car speaker to maximum (this will bring lot noise). - VOLTMETER FUNCTION: Safety when driving is our first concern, so we equip our devices with voltmeter. You can now check the quality of your battery before your trip or daily ride. Battery between 14.8V to 13.4V is when your car is on and moving. Battery between 12.8V to 12.2V is the normal voltage of the battery in your car parked and power off. Battery below 12V change the battery as soon as possible. - ON / OFF BUTTON - Nulaxy KM18 Plus is an upgraded version of the Nulaxy KM18 with On / Off Button. An easier way to turn your KM18 Plus on and off. Nulaxy always thinking about your comfort while driving. - BIG LCD DISPLAY: Developed with 1.44 inches screen to better visualize your phone calls, musics, car battery voltage. Ideal sized screen to assist drivers without disturbing the experience while driving safely. 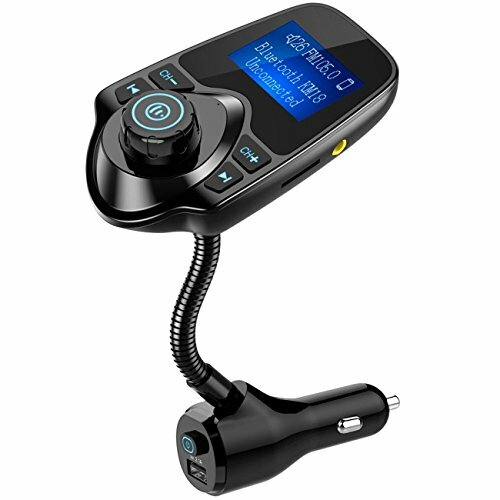 - TECHNOLOGY IN YOUR CAR: With our device you will add in your car: 1) Bluetooth connection; 2) Answer phone calls with a click and safely while driving; 3) Voltmeter function to control the quality of your car battery; 4) 3 different ways to play music in your car and more.